One of the services you can have if you are a member with an online account, is you can apply for a salary loan online. All you have to do is tell your employer about your loan application so they can verify it for you. There are five steps to apply for a salary loan. 1. Visit www.sss.gov.ph and click the ‘Register Now’button. If you are signing up, make sure that the username and passwords that you had used are different from each other, easy to remember and are not your birthdate as they are easy to guess. If you forgot your username and password, you can always call the SSS hotline for a reset, though it may take sometime, so prevent the hassle. Do not write your username and password then just leave it around anywhere, these details are very important. 2. After signing up your account, you can then go back to the homepage to login. If you failed to login in the first try, wait for at least 30 seconds before trying again. 3. Hover your mouse over the transaction and then select the Salary Loan Application. You should have notified your employer about the loan to certify you. 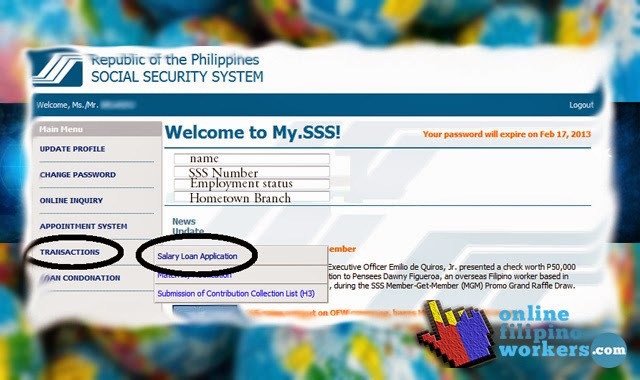 The SSS will not approve your application without the certification of your employer. 4. Put in the necessary information needed like the amount of loan you want to get. Don’t forget to tick the agreement box, then click ‘Proceed’. 5. You will be directed to a window and you must click ‘View Loan Disclosure Statement’. It will show you the amount of loan, changes and deductions, the schedule of payments and interest fee. The process actually take around 2 to 3 weeks from your online application to the release of your check.